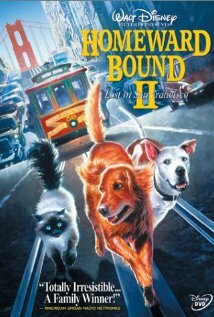 A mistake in the airport luggage department leaves Shadow, Chance, and Sassy stranded in San Francisco in Homeward Bound II: Lost in San Francisco. They must do whatever it takes to reach Canada, which is where their family headed. Of course, that is easier said than done since Canada is so far away from San Franciso. Can they all make this long journey this time? You will have to watch to see what happens for yourself. This is certainly a great movie to watch with the first film for a mini movie marathon. To learn more about this film, you really need to visit http://www.imdb.com/title/tt0116552/?ref_=fn_al_tt_1 for more information. This film gets a five out of five popcorns rating.